I'm a bit sad to not see a reply to this post, because certain inaccuracies are hugely imbalancing to the game on emu servers right now, and preventing me from some database entry work. Having a little more knowledge of how EQEmu works under the hood now, it's obvious to me that what needs to be done is to decouple the NPC logic from the PC logic. 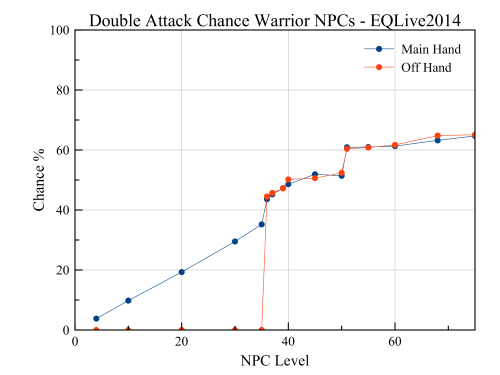 NPC monks on EQEmu were for example using attack delay values from the bare fists delay table for PCs, which is silly. (demonstar fixed this I believe) It's clear to me that NPCs have their own separate simplified combat logic. Even the ability to bash isn't linked to class-- Trakanon for example is a necromancer that bashes. SOE devs seemingly set if NPCs can bash or not independent of class, and just often not gave it to caster NPCs. Class also has no bearing on dual wield or double attack availability or rates, as I mentioned previously. Caster NPCs not double attacking is a huge, huge balance issue and easily resolved. Right now it's impossible to make Trakanon double as he should be; it's either single attack rounds (which should never happen for any NPC in the entire game, minus perhaps level 1 mobs which I have not confirmed either way) or quad rounds without weapons-- there is no other state to set the mob without changing its class to a melee class. Also, flagging an NPC as dual wield capable is making it quad without weapons, so nothing can be set to dual wield in the database right now without making the mobs always quad. This has large implications for charmed pets and NPCs that naturally spawn with two weapons, like guards. Lastly, I learned two more important things since I started this thread: One, level 2 mobs can double attack (just very rarely of course), and Two, NPCs cannot wield a weapon in a particular hand unless the weapon is flagged for that hand just like PCs can't. I.e. Trakanon was only doubling me even though he had multiple teeth (which are daggers) because he couldn't offhand one because it was PRIMARY only. I have to admit, this thread passed me by. Interesting stuff, and will prob take a few days to digest. This is impressive, nicely done Torven. Hope this information is put to good use. Last edited by demonstar55; 06-28-2015 at 11:36 PM..
Great read, makes me want to go do some internal testing. Nicely done. Planning to start a server to tinker with in the next week or two. 36+ there is a level bonus added into their checks. Although I only did rather short parses (27m) rand(1000) worked out for all 3 toons (85 mnk, 85 brd, 67 rog) I was parsing with error of 1-3%. So that satisfies non-pet NPC rates, but what about pets? I'm told that Daybreak is screwing with pet stats lately, so who knows if it's current. 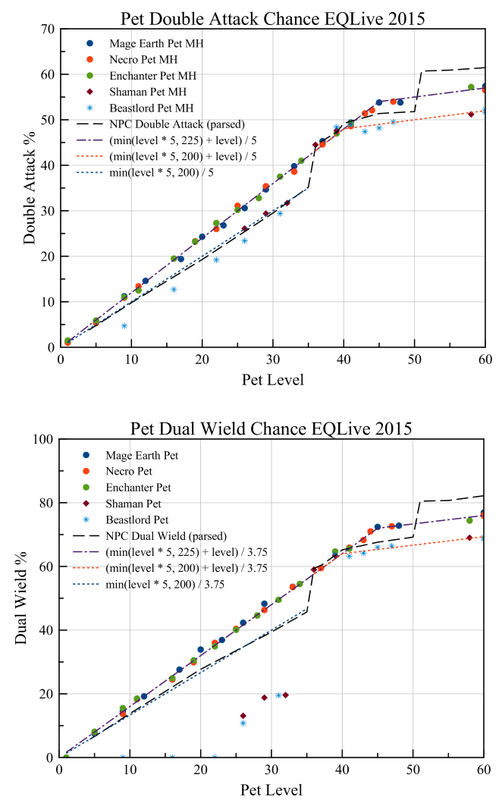 However in 2015, pet effective skill levels were min(level * 5, 225) + level for both double attack and dual wield for mage, necro and enchanter pets at all levels. This resulted in rates higher than non-pet NPCs for most levels. So that's Live circa 2015. But what about old EQ? Time for the hard stuff. The results match min(level * 5, 200) + level very well for pets > 35. You can also immediately see that the level 29-33 pet was not double attacking in the off-hand, indicating a skill of < 150, and the rates also match level * 5. It seems old EQ had rates for mage, necro and enchanter pets equal to shaman pets on Live circa 2015 (minus the unusually low dual wield rate at low levels). I would guess that Sony upgraded those and left shaman/beast pets alone. It makes sense for them to have upgraded pets when they granted PCs higher skill caps. I went on Live and parsed some pet avoidance rates to estimate skill caps. I also parsed my 2015 logs and the results matched logs that I produced in November, so they don't appear to have been modified in the last couple of years. Beastlord and Shaman pets have lower skill caps, shaman pets don't have block, and beaslord pets don't parry. Beastlord pets had block instead of parry on AK as well and were the only pets that did as far as I'm aware. * I didn't parse anywhere near every pet, because these took 8 hours each to make. * It's possible/likely that RNG resulted in a few estimates that were off by a percent, but the above formulae all fit the data except for one case I believe. Again, not all pets were parsed so it's likely not perfect. * The avoidance rolls are ints, so a parsed result even if accurate would indicate a range of possible skill caps. It's possible, for example, that the 175 caps I have up there could actually be 200, but the avoidance rate would be the same regardless. * The level 9 beastlord pet did not rip, parry or dodge. It did block however. The level 11 enchanter pet did use skills. On AK, NPCs didn't use avoidance skills until level 11ish, so it's possible that the very low level pets all don't have avoidance skills like AK's normal NPCs. (other than the blocking) I only parsed the one pet under level 11 though. 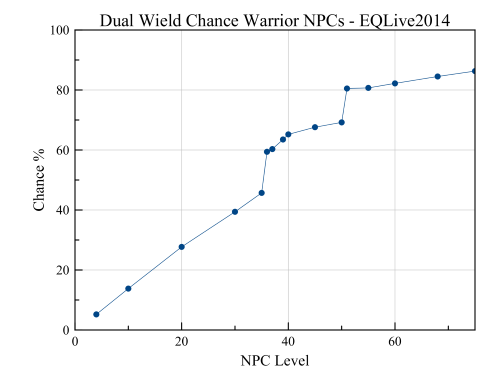 The avoidance rates are much lower than Live's, indicating significantly lower skill caps, which is unsurprising since the double attack and dual wield skills were modified as mentioned previously. I do however think that the avoidance formulae were also modified at some point. My old EQ logs show lower avoidance rates for riposte and parry. Dodge i'm not as sure about as it is harder to estimate since it comes after rips and parries. On TAKP I just increased the avoidance divisors for Riposte and Parry by 5, to 55 and 50 respectively, but I'm far from certain of those values. It makes sense however for Sony to have modified these because they added a bunch of strikethrough in the game, and it's much easier to change the code literals than it is to modify skill caps for every NPC and PC. Block rates seem the same; my old EQ log actually parsed above expected. Block is so strong that it makes sense that they left it alone. Back in 2003, I created some prepared logs to compare Monk vs. Warrior defensive ability. Since these were carefully prepared, no hits were from behind, and all from the same two NPCs, so it's good data; albeit still not as much as we would like for this case. Keep in mind however that avoidance order back then was: Block, Parry, Riposte, Dodge. Parsed riposte and dodge rates will parse a bit lower due to skill order. For TAKP pets, I capped avoidance skills at 100 and added another 25 points for PoP pets. Along with the +5 to the skill divisors, it comes about to what the parsed results above were. (a bit too forgiving if anything) Beastlord pets I capped at 50 block.